This, the first of a couple of back-to-back summer sessions for the year, brings you a not-too-heavy-on-the-ear, voice-drenched round-up of some recent goodies to warm y'selves up with. The results? 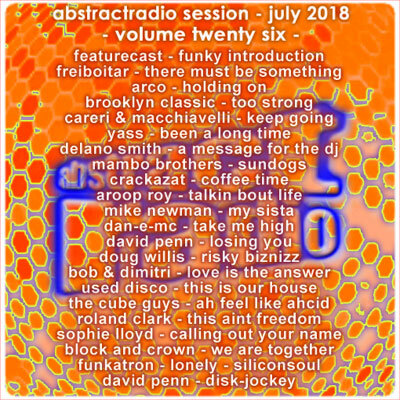 A veritable panoply of top tunage with gems from, amongst others: Doug Willis, David Penn, Sophie Lloyd and Roland Clark, plus a fair few reworkings of some belting club classics from yesteryear. Finally succumbed to the irresistible charms of AbstractRadio? Then ... -> Please repost this mix on mixcloud! ps - don't forget to check out the 2nd half of this melodious malarkey - coming very soon!